The history of the Erinvale Estate Hotel & Spa originates to a landholding owned by Willem Adriaan van der Stel during the mid-1660s. Stel had acquired the estate shortly after assuming the role of governor for the nascent Dutch Colony of Cape Town. In a matter of months, Stel’s massive homestead wound up producing a vast majority of the settlement’s food supply. The virtual monopoly that he controlled over the colony’s resources doomed his status as the colony’s governor though. Eventually, a coalition of wealthy settlers expelled him from Cape Town under charges of corruption. Stel’s estate was then divided by the remaining colonial authorities in the wake of his exile. The portion of the farm on which the Erinvale now currently resides was renamed “Welgelegen,” and became a vineyard for many centuries thereafter. The building that now constitutes the hotel came into existence when the affluent Munnik family constructed its first iteration in 1817. Yet, the structure did not receive the name Erinvale until Edward Strangman purchased the estate some fifty years later. Strangman was a transplanted Irishman who changed the name of the farm to “Erin Vale” in honor of his homeland. Both Strangman and his descendants would live on this marvelous estate for the next 113 years. Three different generations of the family came to own Erinvale, with Edward Strangman’s granddaughters—Doreen and Kathleen—being the last to call the grand estate home. It was during their stewardship that the original farmhouse received a thorough renovation. When the project concluded in 1951, Erinvale assumed its present appearance. Peter Baragwanath acquired Erinvale in 1995 from Peter Gant, who himself had obtained the building during the 1980s. Baragwanath subsequently transformed the homestead into a luxurious resort. But another Irishman would soon own the location, as Baragwanath sold it four years later to Kerry County native and enterprising business tycoon, Xavier McAuliffe. 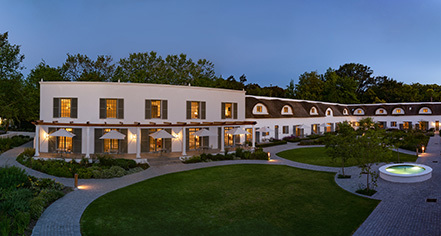 Under McAuliffe, Erinvale quickly developed a strong international reputation for its remarkable service and world-class facilities. Under new ownership today, the Erinvale Estate Hotel & Spa continues to serve as one of South Africa’s most luxurious holiday destinations. 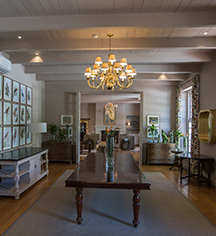 Erinvale Estate Hotel & Spa, a member of Historic Hotels Worldwide since 2018, dates back to 1817.